For my “Out of the Woods” quilt, I wanted to add a forest of trees to a large, graphic mountain I had pieced. My idea was to use straight lines for tree trunks in combination with back and forth lines to create the tree branches. My hope was that these would resemble pine trees or the majestic Redwoods (both were on my mind as I thought about the pattern). To see if the idea would work, I started by practicing drawing the trees on paper. My motto is, “If I can draw it, I can quilt it!” This quick video tutorial gives a short overview of the process and some ideas for ways you can modify the pattern to work for you. 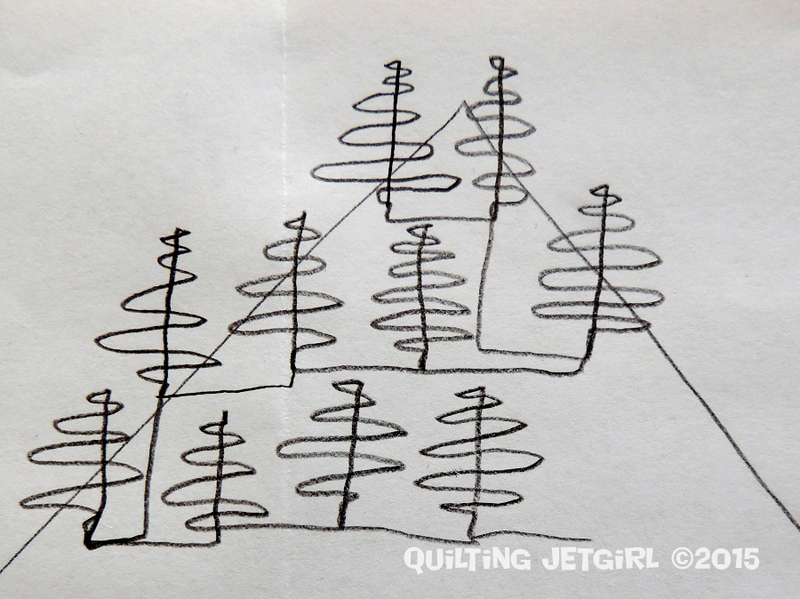 Just remember that even trees are not “perfect” in nature and be kind to yourself as you try new quilting patterns! That looks like a really effective pattern, perfect for your quilt. Obviously any pattern which has scope for natural imperfections has added advantages for me! And I think the video tutorials are part of that whole good for you getting out from behind your screen conversation! You do them really well and clearly. Ooooh, I’m trying to think of an upcoming quilt to play with this on! Great quilting idea and your video clearly shows how you went from drawing to quilting. I can’t wait to see your finishes quilt. I really like this quilting pattern. It almost reminds me of a figure drawing class I took in which the instructor had us pretend that a piece of string was coming from the end of our pencil and wrapping around the person. It was amazing how everyone’s drawings looked so accurate given we were really just drawing loops! What a clever design. I love the different sized trees. Thanks for sharing. What a nice idea and tutorial. I’m starting to do some FMQ on a long arm and am looking for these types of tips and tricks. Thank you for sharing! Now that is come creative thinking! Like everyone else now I am racking my brain for WIPs to use this on! I don’t machine quilt, but still think this motif is brilliant. This is a BRILLIANT motif. You did SUCH a great job on your video as well! So impressive and that was an extremely insightful thought for the trees on the mountain! Totally still jealous of your machine! I just bought time with the rental I use for this Thursday.